More than 100 art enthusiasts are attending a two-day course in Chinese ink painting conducted by artist Tan Khim Ser and the Life Art Society. 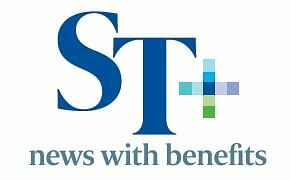 This is part of the ST+ news with benefits programme for subscribers to The Straits Times. Yesterday, participants learnt to paint bamboo stalks, lotus flowers and small fish in an all-day session. A second session will be held next Monday at the SPH News Centre, when participants will learn to paint goldfish, orchids and dogs - because it is the Chinese Year of the Dog. The two-day course is worth $400, but participants paid only $50 for their painting kit on-site from the Life Art Society upon registration. Scientist-turned-housewife Nimmi Suresh, 56, has been taking lessons in Chinese ink painting for 21/2 years and was hoping to strengthen her skills through this course. "I've always wanted to learn this. It's not like the usual watercolours." Another participant, art student Pooja Shree, signed up to broaden her skills. The 16-year-old takes art at Yishun Junior College and this was her first experience with Chinese ink. "It's difficult controlling the strokes," she said, showing off her bamboo stalks. "It's just one stroke, so if you get it wrong, you can't correct it." Tan, who is president of the Life Art Society, is a noted painter and art educator, whose students have included former chief executive of the National Arts Council Lee Suan Hiang and former senior minister S. Jayakumar. At the end of his two-day course, participants will get to display their works in a charity exhibition, which will also feature pieces by Life Art Society's artists. Proceeds from the sales of these paintings will go to the ST School Pocket Money Fund.